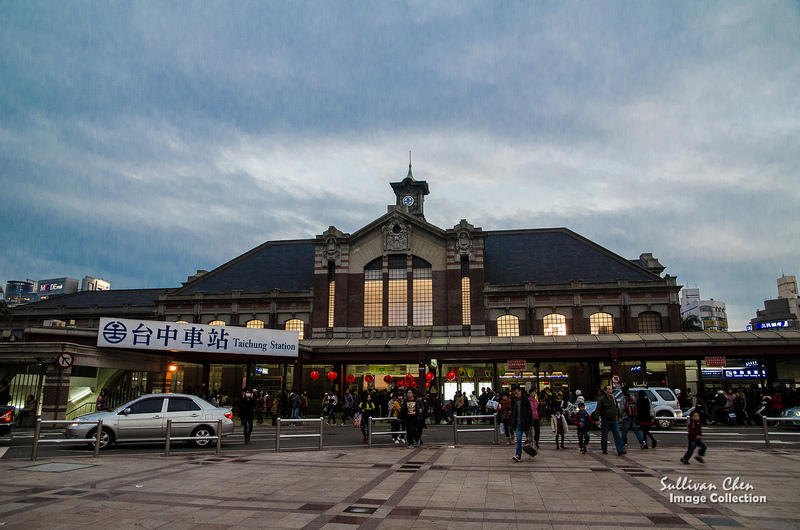 Located at middle west of Taiwan, Taichung is the transportation center of middle Taiwan. Taichng is the transfer center to Sun Moon Lake, Cingjin, Jiji & Xitou as well. There are also lots places of interest in Taichung. This blog will introduce how to go these places and make itinerary plan by public transportation efficiently. In additional to attractions and gourmet, Taichung is also a transportation center of central Taiwan. The bus lines stretch to Cingjin,Sun Moon lake,and Lukang. It takes about 1.5h to Taichung Taichung Railway Station from Taichung Airport and 2.5h from Taoyuan Airport. There are 24 hours shuttle buses to Taipei and Kaohsiung. When you make a whole itinerary plan for Taiwan trip, you can take Taichung as a day trip base. Basing on the transportation and itinerary arrangement, we can split Taichung into 3 parts by railway and freeway. The area between Coast Line Railway and Freeway is Coast Line Area. 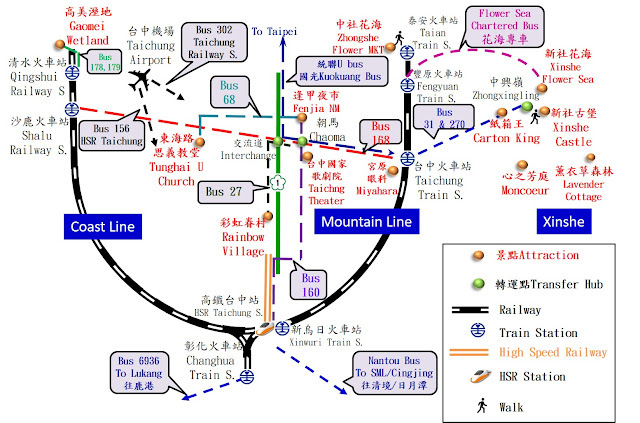 The Mountain Line Area, the central Taichung, is between Highway and Mountain Line Railway. The east side of Mountain Line Area is Xinshe. Since most hotels are around Fenjia night market and Taichung Railway Station. you need 2 days if you want to visit most attractions in Taichung. The simplified map below shows the location of these attractions and how to take public transportation to these attractions. Be aware of the scalar. The Central Taichung, between Taichung Railway Station and Taichung Interchange, is about 7 km in width only. The attractions in Central Taichung won't take you too much time and you should leave about 6~8 hours for the attractions in Coast Line Area and Xinshe. Since the public transportation in Taichung is convenient, it is difficult to list all bus lines in the simplified map. For examples, the map shows only bus 27 to Rainbow Village from Caoma. However, you can take bus 99 or 26 to Rainbow Village from HSR Taichung Station, or take bus 27, 290, 89, 30, 40,56 from Taichung Train Station. You can follow the tips in <Bus Information> to know more about the bus in Taichung. A common question about Taichung is how to get there. From some traveling plan or forums,you may be told to take HSR. The answer depends on your destiny and itinerary. For example, if you want to go to Fenjia Night Market from Taipei Main Station, you can take HSR (NTD 740, 100 minutes) or shuttle bus+taxi(NTD 320, 150 minutes). As you can see from the simplified map, Fenjia Night Market is near Taichung Interchange and HSR is at south corner. The decision depends on the trade off between 50 minutes and NTD 320(USD 10 equivalent). Please refer to Transportation to Taichung for more details. Google Maps is a useful tools in Taiwan. You can use it to check the public transportation route. You can use it to make your itinerary arrange in the planning stage or check the plan on your mobile phone with your current GPS information. Since the English names of Chinese attractions are not unified, fuzzy search in Google Maps can provide you possible locations. If you need the entire map of the bus line to confirm your plan or you need to check the timetable the real-time GPS of the bus, you can visit Taichung City Bus Arrive Time Access. Click the English PDA on your mobile device to get the bus information. Remember to use Easycard or i-Pass when you take a bus in Taichung. It is free to take a bus within 10km if you use Easycard or i-Pass. It is enough for most attractions in Taichung. Remember to tap the card when boarding and alighting. Mountain line the the most convenient area of Taichung. 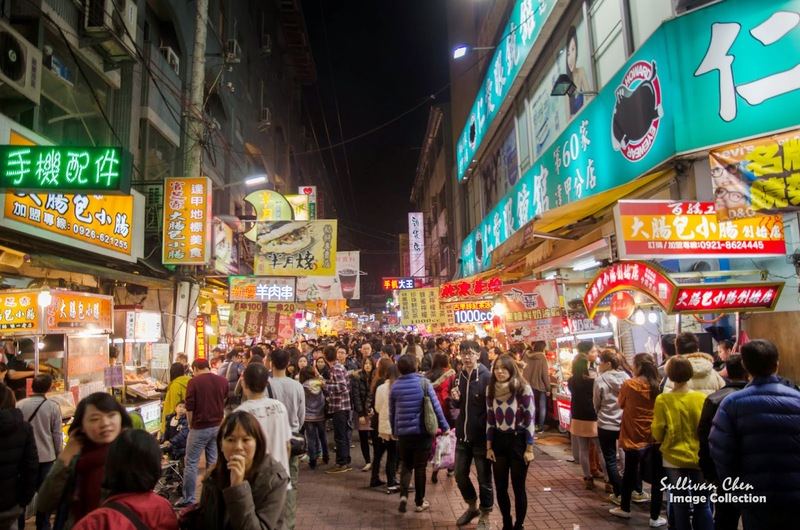 Lots hotels and B&B is around Taichung Train Station and Fenjia Night Market. You can arrive attractions by bus within one hour. Tunghai University and rainbow village is located at the edge of Mountain Line. 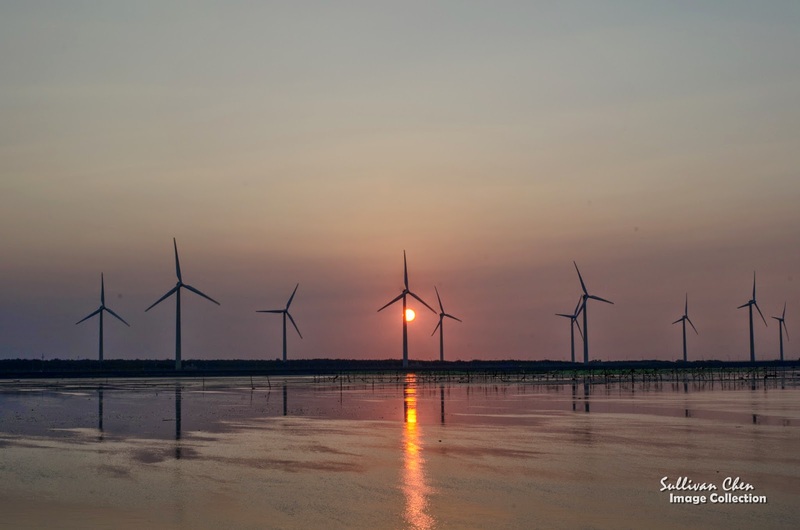 You can go to Tunghai University and Rainbow Village in the morning and go to Gaomei Wetland in the evening. Because Luce Chapel is face east, visiting Tunghai University before noon avoids the problem of backlight when you take picture. The buses to Rainbow Village from Caoma (bus 27) or Fenjia (bus 358) are infrequent . If the the estimated arrival time of next bus to Rainbow Village is too long, taking Taxi is a good choice to save time. A rough estimation of the taxi fee from Fenjia Night Market to Rainbow Village is about NTD 220 or USD 7 equivalent (8KM). Rainbow Village is closed to HSR Taichung Station (3.5KM) and the taxi fee is around NTD130 or USD 4 equivalent. Bus 168 is no longer exist, you can take bus 303/304/305 instead. You can also take bus 111 to Gaomai Wetland. I will update my blog. Hi, i am planning to travel to lavender cottage and xin she on the same day. Would appreciate your advice on the route/public transport to take. Thanks! You need to take cab from Zhongxingling to Xinshe and then to Lavender. 1. Possible to do XinShe Sea of Flower - Xinshe Castle - Gaomei Wetland - YiChung Shopping Street - FengJia Night Market in a day? Or how would you advise if it's 2 days? I think that day 2 will be quite empty if spiltted into 2 days..
2. Are XinShe Sea of Flower - Xinshe Castle - Gaomei Wetland accessible by public transport? If it is not, may you advise how much will it be for cab or private? 3. 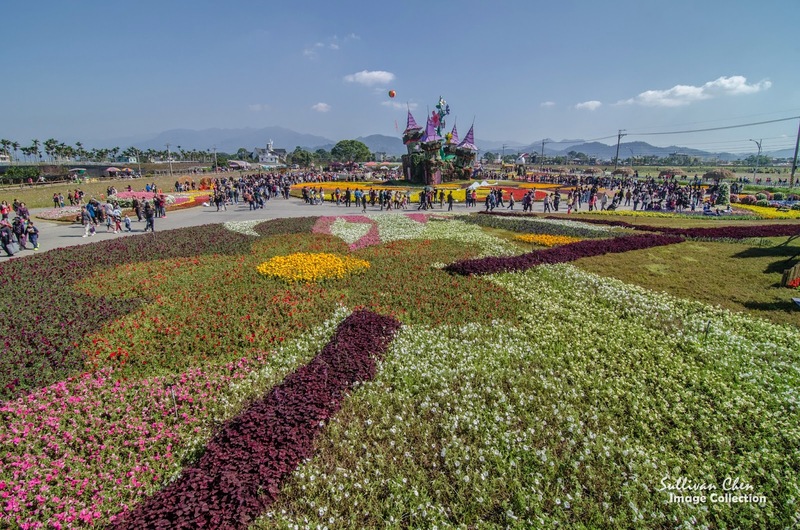 XinShe Sea of Flower has some festival in Nov. Will it be overcrowded everyday? You can visit these attractions by the combination of public transportation and cab. There will be chartered bus to the Xinshe flower sea in the Nov festival. Take a cab to the castle and back. Visit the festival and castle in the morning. Then go to Yichong. You should depart for Gaomei before 2 o'clock since you need to transfer twice. Hi i found a tour in kkday fro 966 ntd for gaomi wetland, rainbow village and miyaha. Meet up is in the taichung station. Do you think its good for its price or its expansive? And its 1200 if the travel is from taipei main station. Advantage: Low frequency of public bus to gaomei and village. You need to transfer too. Disadvantage: The tour bus back to FJ market around 6pm. That's the sunset moment at Gaomei.